Re-did the charcoal filter on the workstation. Very little dust had gotten in since the filter had been installed. 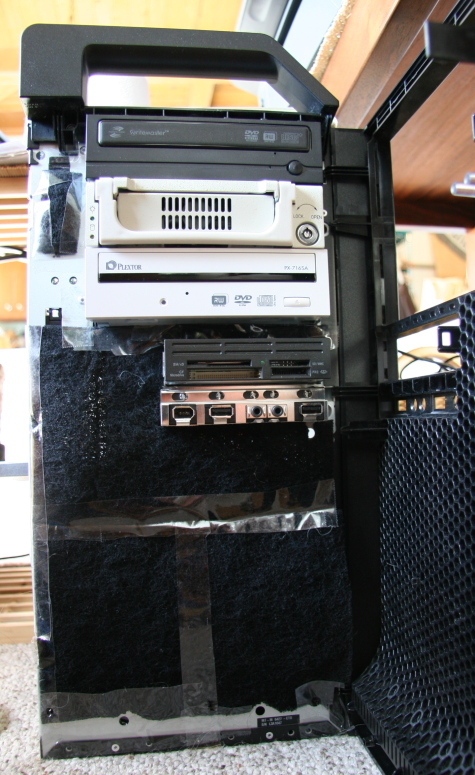 Now, with the new install, the ThinkStation is totally protected with charcoal filters to the extent it can be. All the air moving in or out passes through a filter. This modification would be helpful for most anyone that is Multiple Chemical Sensitive (MCS). Workstations tend to be loaded with heavy metals and flame retardants and who knows what. 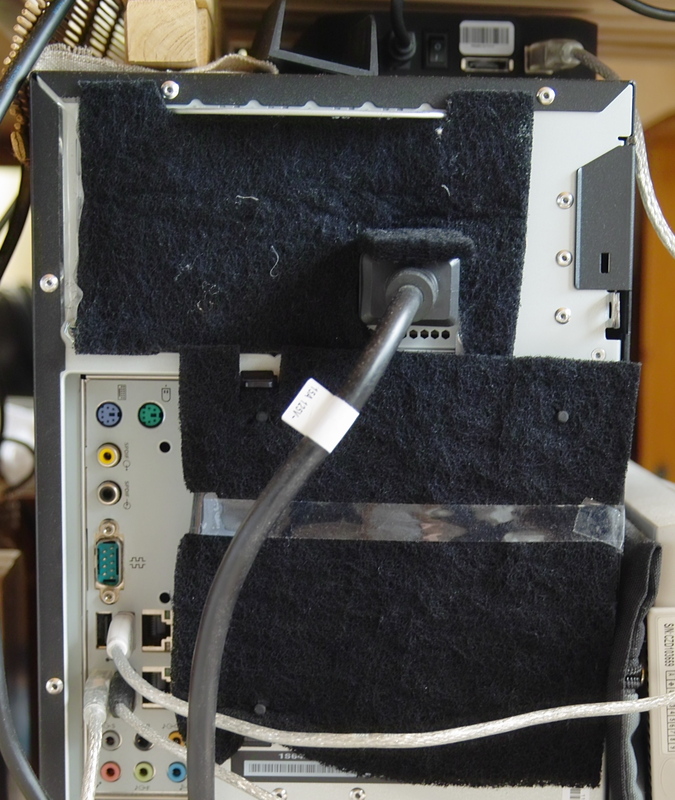 Plus this keeps the dust out and makes the workstation quieter. Here is the filter roughed in before using double faced tape where the air comes in. Here is the filter roughed in before using double faced tape where the air comes out. How well did this work? The toxic fumes dropped many fold and made a huge difference. From sore throat level to nearly unnoticeable! We are talking vision blurring fumes here also! Will this block air flow? These are air filters, and are unlikely to block much air. Massive amounts of dust on fans and heat sinks definitely block air. This will make the workstation run a little warmer perhaps, but so far the fans have not even sped up any. And yes these fans can speed up, sounds like a jet when the power comes on, then gets really quiet, and even quieter with the filters. There will be some amount of charcoal that gets in but I doubt that will cause a problem. If you try this yourself do so at your own risk of course. Side Notes: Also found another used Triplite Isobar surge protector so now the workstation has 12 outlets (total) of surge protection that can hold at bay much higher electrical strikes that the normal cheapo surge protectors. These are really nice protectors. Added another burner and a hot swappable SATA drive. These workstations are very well made! UPDATE: Looking up E-waste or electronic waste or the like quite a bit is written. Motherboards and all those components are made of ALL kinds things including Toxic Metals. The elements in computers span a huge portion of the Periodic chart. Heating all these components, as you can imagine, can send fumes of dozens of elements into the air. Fire retardants are used in many components and in electronics and computers. The US tends to still be in the dark ages of what is toxic and not, plus the US (and China) are the 2 of the worlds leading polluters. Be aware also that “the powers that be” have to AGREE and ACKNOWLEDGE toxicity and then BUDGET and ACT. Those are human acts which happen very rarely. Something that is toxic, is toxic, even if the government does not ACKNOWLEDGE the fact. Thus there are many many toxic things that are not acted upon. And the toxic things that are ACKNOWLEDGED are not ACTed upon the most part. Even, the EPA will not regulate anything that they do not have the mandated BUDGET to regulate – even if they freely ACKNOWLEDGE something is toxic. And companies are basically self regulated. And do you think all the companies that make all things do that? Not likely, that is huge science and effort unto it self. Even the drug companies for the most part do their own testing. And those are monitored by medical people where electronics are not. …Unless a huge clamor is raised. The loudest of the loud is what most people might hear about – mercury, lead, asbestos etc. E-waste because of it’s toxicity is a huge global problem. So I decided, why breathe it? Copyright © 2019 VitalBodies.com. Titan Theme by Jestro.